I’ve been to a lot of funerals in my life, so many that I really have no idea what that number is. The first funeral I vividly remember attending was in high school for a friend who went to my school. While the rumor mill was full of conspiracy theories, it was determined that he accidentally killed himself while playing with or trying to clean a gun. I still have the funeral program because at age 16, it brought me front and center with mortality. As it turns out, the longer you live, the more death you experience. Funny how that works. I watched the funeral for Ermias Asghedom, a.k.a. Nipsey Hussle, at the Staples Center in Los Angeles on Thursday. It was an interesting experience because I kept having to remind myself that it wasn’t a church service. The language was at times profane, there were shoutouts to gangs, use of the n-word, etc. While I didn’t know Nipsey at all, I imagine that if you had to envision what you’d want your funeral to look like, it would be like his. It was real, sad and celebratory; the video montages and photos were moving, to say the least. I didn’t even initially plan to watch, but in the end, I’m glad I saw the entire thing. His mother was special to watch and listen to. The peacefulness she spoke of and exuded was almost unreal. Lauren London was amazingly together. Uncle Snoop, who literally felt like one of my own family members, almost took me out as he struggled early on to get through his remarks, sounding every bit like the elder statesman to the game that he is. But Nipsey’s brother, Blacc Sam (Samiel Asghedom), was the one that nearly took me out. Watching him get up there and speak took me back to the time I had to get up and speak at the service for my best friend who literally couldn’t have been closer to me if we were blood brothers. I remember standing there, trying to keep it together, not wanting to forget what to say while having no idea what to say, even with prepared remarks. I knew that feeling. I still can’t shake what that day was like and how many emotions rushed through me at the exact same time; but I kept telling myself to be strong for my brother. I loved how real Sam kept it and how he clearly set the tone, even though he wasn’t the first or last person to speak. Folks knew that when Sam got up there, it was like Nipsey being present in spirit. And in doing so, Sam reflected a lot of who was there and how his brother should be received, with the realness he lived his entire life. A few weeks ago, I went up to Boston to attend the memorial service for the father of one of my closest friends. I knew his father and had fond memories of him and felt both a desire and obligation to pay my respects in person, for him and for his family, and my boy, who are pretty much my family. Despite going to many funerals, I actually had a moment where I couldn’t figure out what to wear. This was partially because I didn’t want to wear black. This man lived an obviously impactful and joyful life, and though he’d passed, I felt inclined to want to celebrate his life. Black felt too somber. I reached out to my boys to talk about it, and I ultimately settled on a blue suit with some flashes of color. Now, this was a moot point, and I should have realized it early. His father was an academic but also a jazz musician. And there were many, many white people there. This meant that there was almost no way I’d ever be dressed out of accordance with the occasion. That early stress did get me to thinking, though, about my own funeral. While I hope to live a long, storied life, I know that one day, it will come to an end. And I don’t want anybody to stress about what to wear or what type of service it should be. I wear colors. A lot. I’m fly. A lot. How much money I got? A lot. (Not true.) Point is, I want people to come as comfortable and ready for a party as possible. If I die, die, if I die, remember me, ballin’. I want folks to come as fly as possible and as happy as possible because I want my own service to reflect this life I’ve managed to curate for myself. And trust me, it isn’t a sad one. I told my boys that I want a party atmosphere. Celebrations, nothing somber. At the end of my boy’s father’s funeral, they did a New Orleans-style second line to “When The Saints Go Marching In” in celebration. That was literally the most perfect ending ever. It felt like death wasn’t an end but part of the greater celebration of life. And it’s important to me that my kids and my family, whenever it may be, experience that type of feeling. Cry, sure. But smile, too. I don’t know if Nipsey had any idea what he’d want in the way of a funeral. I read that he’d been more or less concerned that folks were trying to get to him, but it also seemed like he’d accepted life as his calling. He seemed...happy, while still looking for freedom for his community. But even if Nipsey hadn’t give his funeral any thought before he died, I can’t imagine that he’d be anything short of pleased and happy with that send-off he received. Over 20,000 people showed up, not to mention the thousands outside the venue, and others, myself included, who watched the entire thing online, paying respects to a man whose energy was clearly too large to be contained by life. There was no pretense, no limitations short of respect. Folks came real, in the spirit of a real one, Neighborhood Nip. I watched that service thinking to myself, when it’s my time to go, I hope that there is this freedom of respect without pretense of respectability. Treat my death like I treated my life. I hope it’s too early to think about things like that, but one thing Nipsey showed us (and frankly, so many others like him) is that you never know when it is your time to go, all you can do is optimize the time you have here while having the best possible affect on others that you can. Apparently, for Nip, that goal was achieved. When the funeral ended with video and music montages, I got sad, but I also smiled. 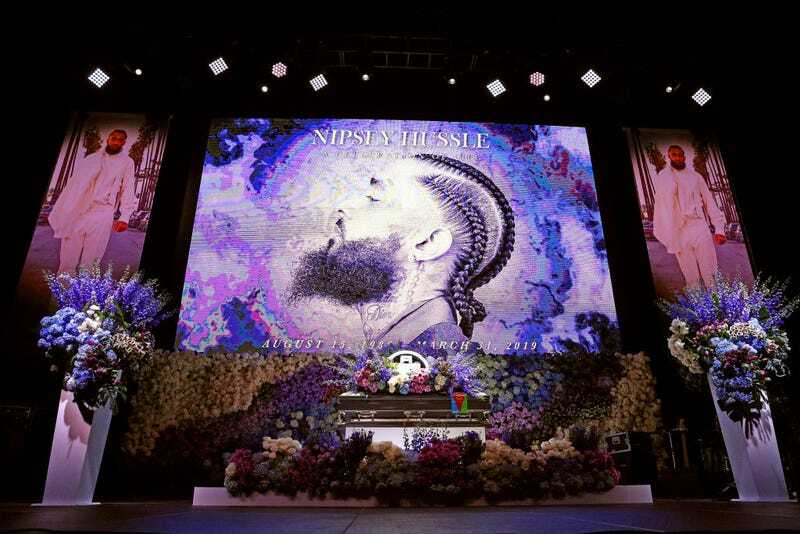 It was such a fitting conclusion to the service with Nipsey providing the processional music, with words and visuals that evoked a higher presence. It may never bring closure, but peace is as good as we may get at times. I don’t see death around the corner, yet. I hope I have more life to live. But know, when it’s my time, my life was a party and a joy to live. I hope the celebration of my transition is the same.